Checking the transmssion fluid isn't intuitive, the "dip stick" is a bolt, not a stick, and getting to it isn't so easy. The bolt is on top of the transmission housing, below the heat exchanger. Transmission dip stick bolt from port side of engine. Getting to it from here doesn't look too easy. This is easiest for me from the back berth - with the access board off (the panel that covers the large water tank). 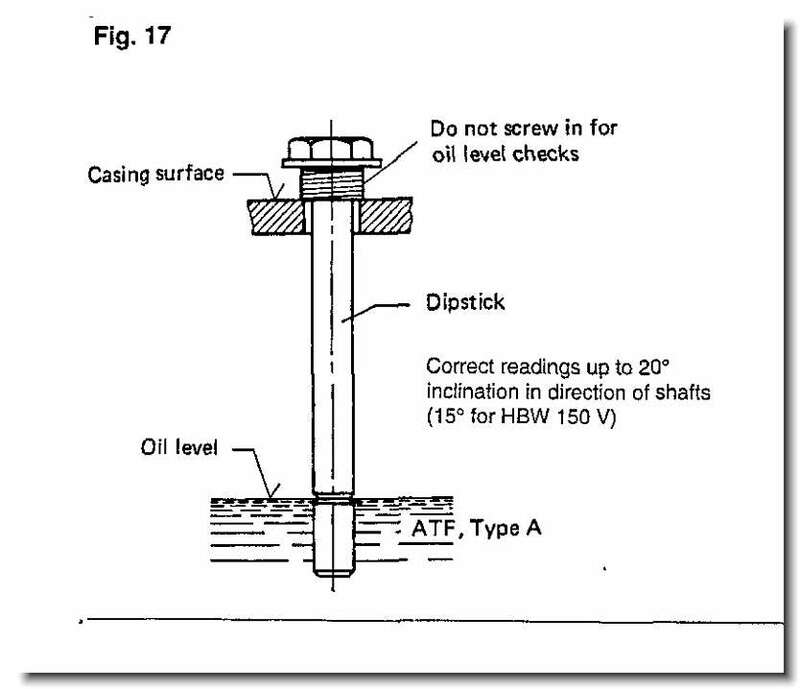 The dipstick bolt is next to the oil grade label. 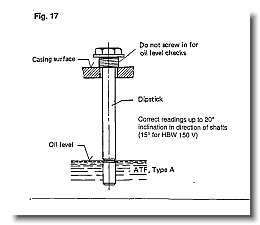 The oil level should be up to the index mark on the disptick, approximately 1/4" up from the bottom of the stick. Everything good? of course! Put the transmission dipstick back in and tighten the bolt. The dipstick has a vent hole at the side of the top of the bolt. If you're painting stuff, don't cover this up! The transmission oil quantity is on page 30 in the Hurth Service Manual and Spare Parts List. The Universal M25 Owner's manual is incorrect in stating the quantity is approximately 1.3 pints (.55 liter). Don't leave the gear in forward when sailing. Put in Neutral for free wheeling or reverse to lock the prop. Reference the Owners manual.